First Sentence: Quentin rode a gray horse with white socks named Dauntless. 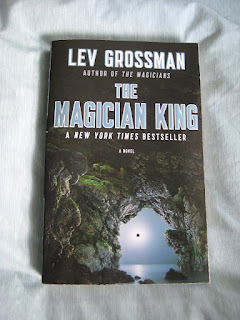 Right off the bat, I'll tell you that The Magician King is the sequel to The Magicians, and thus this review is going to have a bunch of spoilers in it for The Magicians. So for those who want to stop reading here, I'll say that I really highly recommend The Magicians, and only slightly less highly recommend The Magician King. For those who don't care about spoilers and are still reading, the reason that I recommend the sequel less highly is that it's just really unnecessary and doesn't have enough magic in it. You may remember The Magicians as being the best book I read last year. I read it after A Bend in the River and it's what convinced me to love reading again. The story is basically Harry Potter + Chronicles of Narnia + college angst, and it was the most enjoyable fantasy book I'd encountered in quite a while. Quentin Coldwater is a high school senior obsessed with a series of children's books about a magical place called Fillory. He's pretty mopey and, like, 75% of the people read the book seem to hate him with a violent passion that I reserve for the likes of Sebastian Dangerfield and, dare I say it, James Joyce. Imagine Quentin's surprise when he's randomly selected to take an entrance exam at a magic school called Brakebills. His experience there is basically regular college debauchery, except while learning magic instead of your typical post-secondary courses. Quentin and his bunch of friends graduate and then basically squander their lives in magic-enabled decadence. Imagine his surprise again, then, when it turns out that Fillory is as real as magic is, and the stories in the books are true but darker. Insanity ensues, by which I mean a lot of death and destruction, and Quentin goes back to reality and gives up magic. The first book ends with Quentin's return to Fillory, with his friends Eliot, Janet, and Julia, to become kings and queens. The Magicians was full of really intense, interesting magic, which provided relief from all of the angst. It also had some really scary monsters, particularly "The Beast," a very powerful humanoidish thing whose first appearance involves immobilizing an entire classroom full of people and then killing one of them. Imagine no one's surprise when Mr. Impossible to Please (i.e. Quentin) gets bored again at the beginning of The Magician King and decides that he wants to go on a quest to liven things up a bit. Insanity ensues once more, this time with ocean and inter-dimensional voyages, interspersed with the story of how Quentin's friend Julia developed her powers (she didn't manage to qualify to attend Brakebills, and thus had to use other means to learn how to do magic). If you're one of the people who doesn't despise every character in these books for being too debauched, the next thing that may trip you up is Grossman's style, which is too expository to be truly great, i.e. he does rather more telling than showing. It works just fine for me, but I can see how it might not quite be your cup of tea. The climax also lacks punch, although the shock of the culmination of Julia's story makes up for most of that. As I say above, though, the main problems with The Magician King are a lack of magic and lack of reason for existing. ...As much as I enjoyed the book (even with its problems), I don't think it needed to be written. The Magicians has a nice open ending, after which everyone presumably lives (as) happily (as possible under the circumstances) ever after, but The Magician King seems to reduce the scope of that ending in disappointing ways. I read this book for the same reason that I played Portal 2: I adored the original so much that I looked past all my doubts about a sequel because I just wanted more. But where Portal 2 deepened its universe and retained everything that made me love the first game, The Magician King fell short of those marks. I'd say that the book is still worth a read, but you could just as easily stop reading after The Magicians and not be missing too terribly much. "Oh, Jolly," Janet said. She crossed her arms in mock outrage. "You should have let us catch it! Now it'll only tell your future." She sounded not at all disappointed by this, but Jollyby—a superb all-around huntsman but no National Merit Scholar—looked vexed. His furry brows furrowed. "Maybe we could pass it around," Quentin said. "It could do each of us in turn." "It's not a bong, Quentin," Janet said.